Going raw for vibrant health and fighting disease! "When you eat a lot of raw food it's not very long before raw food begins to work its magic and your blood chemistry starts to change and your cells come alive. As your body begins to cleanse and renew, you start to look and feel different, and you start to become aware how sick your body really was." Raw foods are based on organic ingredients which have been neither processed nor depleted of their vital substances. What foods are classed as raw? Uncooked, fresh fruits and vegetables. 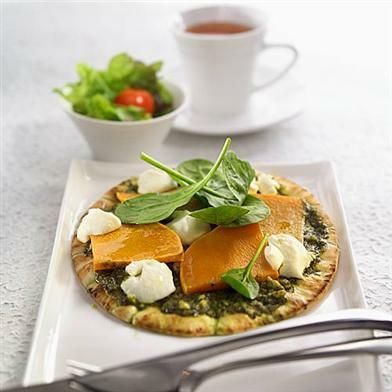 Salads, especially leafy green vegetables i.e. kale. All nuts and seeds like hemp seeds and (my favourite) alfalfa. Sprouted beans, pulses and legumes. Sprouted grains, like my favorite wheatgrass, as well as quinoa. Indoor greens like the sun flower. Superfoods, especially goji berries and macca. Flavourings and natural sweeteners, like agave nectar, and stevia to replace refined sugar. When requested, Natalie gives her patients a raw food recovery plan full of tasty recipes for breakfast lunch and dinner. Incorporated into the plan are specific juice recipes to help with the patient's particular illness or disease. Raw food meals are far from boring; you're not chewing on carrots or salad for every meal! Natalie can give you tasty Raw Gourmet meal recipes that are easy to make. It is easy to buy good quality, organic, raw and living foods. They're much more easily available now than ever before. There's new raw foods appearing in major supermarkets all the time, including your normal fruits and vegetables, just uncooked. 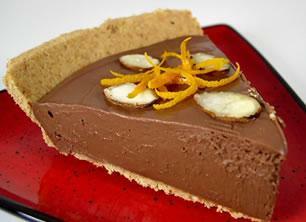 Email me for this recipe! It would be an advantage if you had a food mixer, and a juicer. 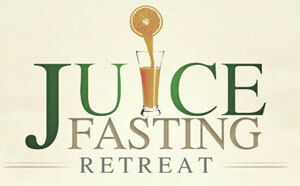 Please go to my Treatments page and read "Juicing" to see the juicers I recommend. However if you are on a low budget don't worry, I can help you start the plan. 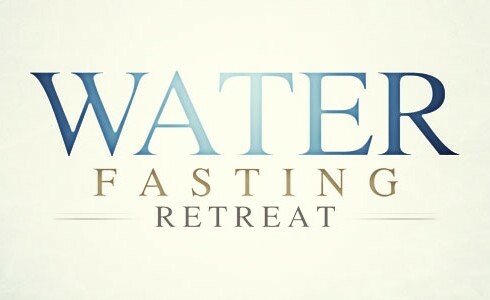 So are you ready for your body and your life to be radically transformed? If so please email or call Natalie for a Consultation or an Online Consultation. COMING SOON!!! More info and videos on eating raw, and growing your own live foods at home in a cheap and easy way. Eating Raw also helps your purse stay full, it's so much cheaper than you think to eat in this way. Natalie first heard of wheatgrass when she discovered the late Dr. Ann Wigmore's website and books. Dr. Wigmore was a pioneer in the use of wheatgrass juice and living foods for detoxifying and healing the body, mind, and spirit. Wheatgrass is grown from the red wheat berry which is a special strain that contains high concentrations of chlorophyll, amino acids, enzymes, minerals and vitamins. Wheatgrass must be juiced to obtain the maximum nutritional value from it. In its non-juiced form wheatgrass is non-digestible due to the high levels of cellulose and its fibrous nature. Wheatgrass juice makes all the high levels of nutrients the wheatgrass contains available for digestion. 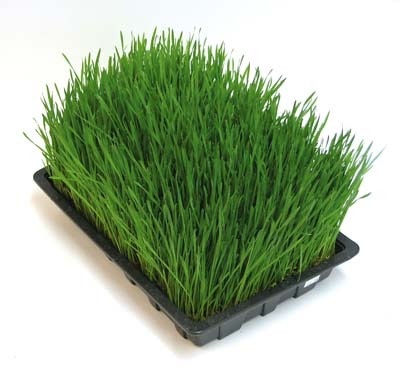 Wheatgrass kits are available which enable you to grow your own wheatgrass. This can be more economical than buying it pre-grown although it requires more effort to get your supply of wheatgrass juice. Wheatgrass can be grown indoors if you have a window that receives sunlight daily, but not direct scorching sunlight. You will need a wheatgrass capable juicer to be able to juice wheatgrass. 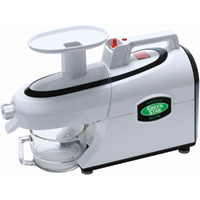 The most common type of juicer (centrifugal juicers) are not capable of juicing wheatgrass. Not even the "Champion" juicer will do. To the right is a picture of a manual wheatgrass juicer which works very well. You just need a little arm work. Prices start from around £30. 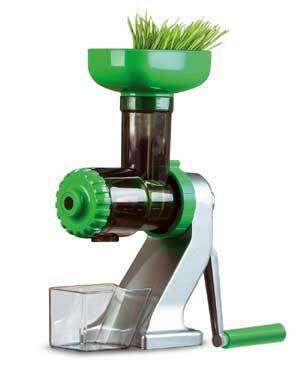 The Green Star Juicer is one of the best juicers around, needless to say it does juice wheatgrass very well. The price is around £500. So what's so great about this wonder grass? Firstly it's called the Alkaline King as it is 66.4 MHZ, the highest alkaline food. Now we know that cancer and many other diseases cannot survive in an alkaline environment. That is why many health institutes around the world incorporate wheatgrass into their healing treatments. Wheatgrass benefits include 17 amino acids which are the building blocks of proteins, 92 of the 102 minerals found in the soil. These minerals include calcium, phosphorus, iron, magnesium and potassium. It is a rich natural source of vitamins A and C. Wheatgrass has more vitamin C than oranges and double the vitamin A found in carrots. It is exceptionally rich in vitamins E, K, and B-complex, and is also a natural source of laetrile (B-17). It also has abscisic acid which helps fight cancer. Other health benefits include anti-inflammatory, natural detoxifier, improves liver functions, stimulates metabolism, eliminates bacterial growth, increases energy levels, is a natural source of chlorophyll and protein, increases red blood cell counts, produces vitamin A, renews and builds blood, deodorizes the body, strengthens the immune system and aids in weight loss. Wheatgrass is one of the richest, most natural sources of chlorophyll. Known as the "blood" of plants. It is useful as an anti-inflammatory, for purification and basic renewal. The anti-inflammatory part of chlorophyll, called superoxide dismutase, plays a vital role in reducing inflammations throughout the body. The purification attribute stops the growth of bacteria in wounds, eliminates odours of the body, reduces bad breath and removes chemicals from your body through detoxification. The renewal and rebuilding of blood is due to the similarity of chlorophyll to haemoglobin. They are virtually identical with the exception of the central atom (chlorophyll contains magnesium in the central atom, whereas haemoglobin contains iron). Wheatgrass contains approximately 25% of the recommended daily value of protein, while meat only has 17% and eggs only 12%. The protein in grass is in the form of polypeptides (shorter and simpler chains of amino acids) which are deposited more efficiently into the bloodstream and tissue. Protein is essential in the building and repairing of tissues and is an important building block for your bones, muscles, cartilage and skin. Wheatgrass contains 100 enzymes which digest the toxins in your body. The toxins from unhealthy foods and the environment accumulate in your body. Using organic wheatgrass you will experience a cleansing process, but don't panic, this means it's working! Beta Carotene comprises most of the carotene found in green plants. Beta Carotene is an excellent source of vitamin A which is useful for strengthening your immune system and reducing your chance of infection. Vitamin A is an important aspect of a functionally correct metabolism. It is said to enhance the production of RNA which is essential in renewal, protect your body from viruses, build and repair bones, strengthen skin and nails, and strengthen mucous membranes. While too much vitamin A from animals (retin) may be toxic, your body stores any amount of vitamin A from plants (beta carotene) until it is needed. If you grow your own wheatgrass it should be cut when it reaches around 7 to 8 inches as this is when it reaches its nutritional peak. You can normally see the grass split into two. This shows the grass is ready to harvest. While it is quite sweet the taste of wheatgrass juice may seem a little strange at first. You may prefer to make juice from a combination of wheatgrass and other fruits or vegetables, especially a little freshly juiced apple. The power of nature should never be underestimated. People normally start off drinking around an ounce of wheatgrass juice a day (with or without other juices) and then gradually increase the amount to around 4oz of wheatgrass juice a day. One handful of wheatgrass will produce approximately an ounce of juice. Sometimes when you first drink wheatgrass you might feel a little nausea or cramps. If so, this may be a sign of some problem with your body. If this happens don't worry, start with a teaspoon twice a day for a week, then a teaspoon per day until you can up your intake more. I believe that our bodies can only uptake 2-3 ounces per day, then we just pass it through our urine. Goji berries, Bee Pollen, Maca, Blue Green Algae, Chlorella, Marine Phytoplankton, Spirulina, Dulse, Nori, Kelp and Cacao. Sprouts are very special. They are alkaline and are 'live' food comprising essential and balanced nutrients for 'alive' people, as life proceeds from life. Life and health go together. Grow in any climate at any time of the year. Require neither soil or sunshine but are still rich in vitamins and minerals. Have not been subject to chemical sprays while growing. Are extremely economical and in preparation have no waste. Rival meat in nutritive value. Can be grown indoors within a minimum amount of space. Multiply 400% or more in 5 days. The starch converts to simple sugars. The protein provides amino acids. The fats break down into essential fatty acids. Minerals chelate or merge with protein in a way that increases their function. 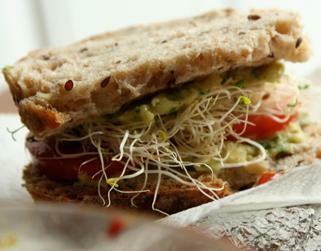 Living sprouts are quality foods of high biophotons (bio meaning 'life', photon meaning 'electromagnetic'). Bio-genic living foods offer the strongest support for the regeneration of cells (25% of daily food). Bio-active foods are life-sustaining, organic, fruits and vegetables (50% of daily food). Bio-static foods do include cooked foods (85% of the nutrient value may be lost in cooking) which slow down the life process and accelerate ageing (no more than 25% of daily food, but these are certainly not the best for the body). Bio-acidic foods are regarded as 'life-destroying' and include sugar, white flour, tea, coffee and all processed foods. Sprouts are a powerful source of antioxidants in the form of vitamins, minerals and enzymes which assist in protecting the body from free radical damage. Free radicals are created in our body by some foods, some cooking oils, preservatives, artificial colours, flavours, additives and other substances in our environment. Dr. Otto Warburg, twice Nobel Prize winner 1931 and 1944, found the growth of cancer cells were initiated by a relative lack of oxygen, and that viruses, bacteria and cancer cells could not live in an alkaline and oxygen-rich environment. When we cook food, the oxygen is destroyed. For this reason, eating raw sprouts, regularly, is valuable to health. Sprouts provide us with whole foods full of living enzymes; a vital life force. Sprouts can be grown on your kitchen sink very quickly and transferred to the meal table the next day ready for eating - there's nothing as fresh as that! Sprouts are a good source of essential fatty acids (EFA). The average diet is generally deficient in EFAs. These fatty acids are essential to life, performing many vital body functions and playing a major role in immune defenses. Sprouts are one of the highest food sources of fibre which is essential for good health. Chlorophyll rich foods are our most powerful blood cleansers and blood builders. Sprouts grown to the chlorophyll rich, two-leaf stage have been shown to be effective in overcoming protein deficiency anaemia. Some women have found that including chlorophyll rich foods in their daily diet has given relief from the hot flushes of menopause and supported hormonal function. Sprouts are part of preventive medicine. 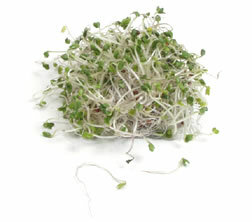 We can be sure when we eat sprouts daily, we are providing building materials for the growth and repair of the body. Our health is very much related to our diet. Our choice of food determines the quality of our physical well being. Raw foods contain oxygen and sprouts have an abundance of this element. Oxygen is important for healthy cells by allowing them to live and breathe. "Food is intended to promote life, a concept which seems to elude many, as we observe the large numbers of people who inhabit broken down, sluggish bodies which are hard to get started, hard to keep going; and who are fortified by stimulants and depressants, and spend long years laboring under the burden of excesses which work to dim the glow of vitality through the passing of time and to diminish the exuberance of feeling fully alive." Sue Jensen, "Food For Thought", Hartland Publications. Coming soon! Keep an eye out for our video teaching you how to grow wheatgrass and sprouts in your own home.